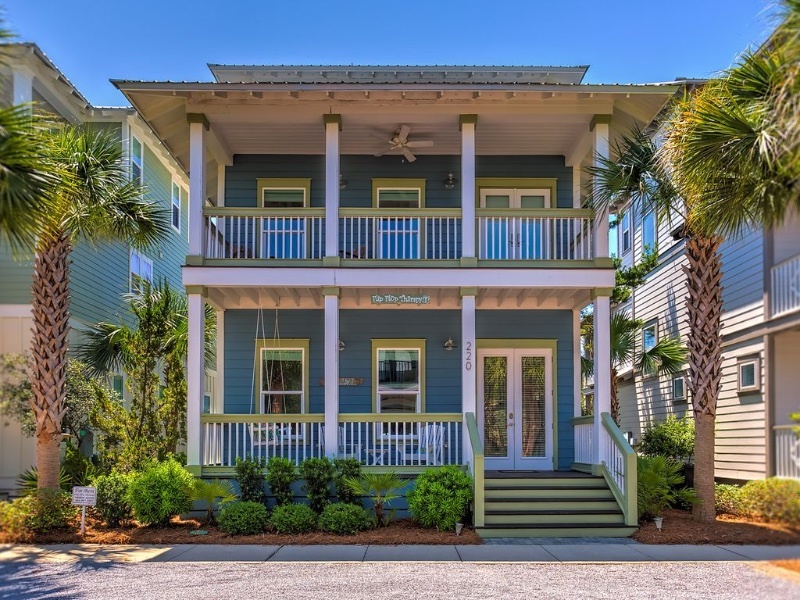 Your journey to vacation bliss begins at FLIP FLOP THERAPY, a spacious, 3 story, 4 bedroom, 4.5 bath, home that will bring smiles to your face as soon as you enter. Decorated in cottage style and sea glass colors, our beautiful 2400 square foot beach home features light-filled living areas, 10 foot ceilings, hardwood floors throughout, ceiling fans, 4 porches and a full size washer and dryer – because sometimes you just have to do laundry even on vacation. Ideally located about two blocks from our front porch is the 12,000 square foot Lagoon pool, a magnificent, relaxing retreat reminiscent of pools at the finest resorts. If you are looking for sand between your toes, you can either walk to the beach which is about 500 yards from our house or, you can call the free tram service, then hang out under the breezy fan on the front porch and wait to be picked up and transported, with your beach gear, to one of the most beautiful white sugar sand beaches in the world. Still sandy when you return home? Check out the outdoor shower on the locked bike shed behind the house. The main floor great room has a large HD TV with a DVD player and comfy furniture. Beckoning from outside the double French Doors, in our beautifully landscaped yard, is a dreamy white pergola complete with hammocks for relaxing between biking, swimming, shopping and eating. If you enjoy grilling, the gas barbeque is also right out the back door just steps from the fully equipped gourmet kitchen which has quartz counters, a gas stove, stainless steel appliances and an under- counter wine and beverage cooler. The dining room table comfortably seats eight with extra seating at the 13 foot kitchen counter which can also be used for buffet style serving. Our home, which sleeps 10 comfortably, has 4 bedrooms, each with its own bath, TV, and private porch perfect for morning coffee, catching the breeze while reading your favorite book or experiencing the magical colors of the sky at sunset. The first floor bedroom is ADA friendly with a king size bed and wheelchair accessible vanity and shower. On the second floor, the bunkroom sleeps 4 and is located in the front of the house. The 2nd floor master bedroom, located in the back of the house has a king size bed, double sinks and vanities, a separate tub and shower. The tower room, a private sanctuary, is located on the 3rd floor and also has a king size bed.